Bloom argues against giving empathy a central role in normative moral psychology. But by defining "empathy" somewhat narrowly, he perhaps makes his thesis a little easier to defend, and less radical, than if he were to come out against strong feelings of compassion generally. The boycott arose after Steven Salaita, who had been scheduled to start teaching at UIUC this term, was summarily dismissed by the chancellor of UIUC in the wake of some controversial tweets about Israel and Zionism. (His contract had not been completely finalized yet; sometimes they aren't until after one has already started teaching.) His old tweets can be found here. Much has been said on both sides (e.g., against Salaita 1, 2, 3; in defense of Salaita 1, 2, 3). My opinion is that the pro-boycott case is stronger than the anti-boycott case: Salaita's tweets were not sufficient grounds for the chancellor's extreme and unusual action; and even if they were sufficient to justify revoking his position, Salaita did not receive due process. A strong response is warranted. (1.) Given the recent and not-so-recent history of extreme violence against Jews and journalists, reasonable people reading Salaita's tweets might understandably be upset to see these public statements coming from a senior scholar in a position of trust and authority -- even if carefully reading the tweets in context might show them to be less hateful than they at first seem. (2.) The argument that the UIUC chancellor behaved wrongly in canceling Salaita's appointment is not identical to the argument that a boycott is the best response. A boycott sends a strong statement; but it also harms many people who have done no wrong. I believe that graduate students are especially harmed, since interacting with visiting scholars and speakers is central to their education, exposing them to views other than their professors' own and putting them in contact with the larger scholarly community. With heavy heart, I am honoring the boycott. I have canceled my talk and abandoned my conference plans. ... in the English language, at least as implied by certain awards nominations and "best of" placements. Okay, I'm a dork. I want to apologize right away for this list, for two reasons, but then also excuse myself for two reasons. First apology: It's a little weird for me to occupy space in a philosophy blog with talk about science fiction magazines. I know! Excuse: I've come to think that science fiction, and other types of "speculative fiction" (e.g., Borges), is an interesting and valuable way to explore the metaphysical, ethical, and epistemological dimensions of various "what-if" possibilities. The concreteness of speculative fiction, and the way the stories engage the emotions and imagination, has I think both epistemic virtues (you think through the specific scenario somewhat better) and shortcomings (you might be too influenced by particular incidental features). Serious speculative fiction belongs in the philosopher's toolbox. Okay, I know, I'm still a dork. Feel free to stop reading now, lest you become a dork too! I gave each magazine one hit every time it had a story nominated for a Hugo, Nebula, or World Fantasy award (at short story, novelette, or novella length), 2004-2013. I am not attempting to include the horror / dark fantasy genre, or other related genres, except incidentally as those other genres happen to appear in Hugo, Nebula, World Fantasy, Dozois, Horton, or Strahan. I'm not including edited anthologies -- only regular magazines -- though about half of all nominated stories and "Best of" selections appear in edited anthologies. I also don't attempt to correct for a magazine's only having published during part of 2004-2013. Reputations of defunct magazines (e.g., SciFiction) slowly fade, and they are sometimes restarted. (Weird Tales!) Reputations of new magazines (e.g., Lightspeed) slowly build. A ten year window seems right. I take the list down to magazines with two hits. One hit might be a fluke. But actually there are some very good magazines with only two or three hits. A bit more about that at the end. First, really just a few magazines dominate the nominations and "best of" selections -- especially Asimov's and F&SF. Given the chanciness and subjectivity and imperfections of the submission and selection process, and given the fact that excellent authors might sometimes prefer venues other than the top few on this list, I find it difficult to believe that those few magazines really have that proportion of the highest quality stories. Almost half of the hits are from the top two, and 83% are from the top ten. And there are very good magazines that don't appear on this list at all (Nature's "Futures" series, Lady Churchill's Rosebud Wristlet, Daily Science Fiction, Flash Fiction Online, Abyss & Apex...). Second, excluding the two prestigious "literary fiction" magazines on the list (The New Yorker and Conjunctions) 20 of the 27 magazines either started or ceased publication during this ten year period. It's a troubled industry. All but a few magazines fail after a few or several years, but dedicated editors regularly launch new magazines (or scoop up the right to old titles) and try again. Not radically different, though as Sean suggests, it does show some broadening away from Asimov's and F&SF toward others in the top ten. Following another suggestion of Sean's, I looked at five and ten years' selections of novelettes and short stories from the Locus Recommended Reading List (no novellas this time). 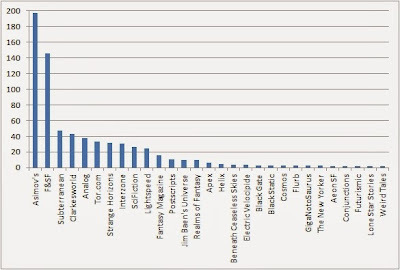 Over a five-year window, the spread is considerably flatter than my original ten-year list above, with the number one Asimov's (60) approximately doubling the number 5 Subterranean (25) and five times the number 10 Beneath Ceaseless skies (13). Also Intergalatic Medicine Show, Interfictions, Nightmare, The Dark, and Tin House now appear (2-3 hits each). 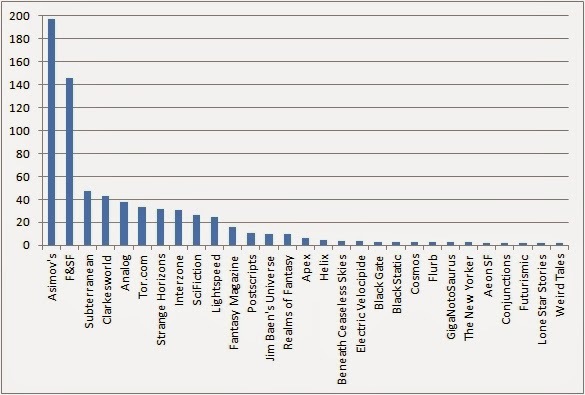 Over a ten-year window, the top-ranked magazines start to pull away again, with Asimov's (164) and F&SF (142) well ahead of the 3rd to 7th ranked (all 31-40 hits). Magazines on this list that are not mentioned above are Argosy, MIT Techology Review, Harper's, and Lady Churchill's Rosebud Wristlet (2-3 hits each). See The Underblog for my full Locus ranking lists. In 2001, I published a piece in the American Philosophical Association's Newsletter on the Status of Asian & Asian-American Philosophers & Philosophies. In light of my recent reflections about the visibility of non-Western philosophy and philosophers, and especially this remarkable piece from an Asian-American who left philosophy, I thought I'd reproduce a revised version of the essay here. I've appended two new substantive notes at the end. Why Don't We Know Our Chinese Philosophy? APA Newsletter on the Status of Asian & Asian-American Philosophers & Philosophies, 1 (2001), 26-27; revised 2014. Philosophers in the United States have all heard of Confucius (Kongzi) and Laozi (Lao Tzu). Some have also heard of their approximate contemporaries in classical China: Mencius (Mengzi), Zhuangzi (Chuang Tzu), Mozi (Mo Tzu), Xunzi (Hsün Tzu), and Han Feizi (Han Fei Tzu). So why haven't most of us read any of their works? Are they not really philosophers? Even applying the narrowest criteria for what counts as a "philosopher", it would be strange to deny that Mozi and Xunzi are philosophers. Both produced long, discursive works on ethics and political philosophy; both support their views with reasoned arguments; both offer counter-arguments to opponents' views. Han Feizi is similar in structure, though more narrowly focused, like Machiavelli, on advice for achieving political power. Mencius and Zhuangzi did not write in standard philosophical essay format, but both offer persuasive arguments for positions in ethics, political philosophy, philosophy of mind, and epistemology. Unconventional format should no more disqualify Mencius and Zhuangzi than it does Nietzsche and Wittgenstein. Confucius and Laozi are more fragmentary and less argumentative; but many ancient Greek philosophers are even more fragmentary than Confucius and Laozi. Nor do these philosophers rely on any narrowly religious dogma; rather, they start from considerations that are for the most part intuitive and widely acceptable even in the contemporary United States. Despite the fact that their works are more often taught in Religious Studies than in Philosophy departments, their religious commitments are less invasive and dogmatic than the religious commitments of many European philosophers. Mengzi's and Xunzi's arguments are far more secular than Descartes's and Berkeley's. Perhaps, then, these classical Chinese philosophers are insufficiently important to warrant broader attention in the United States? If "important" means good, it's not clear that this is so. Although to some extent such judgments are a matter of taste, in my estimation Mengzi and Xunzi's views of moral psychology are as good as anything we have going now [note 1], and their debate about whether human nature is good or bad is considerably more sophisticated than the corresponding debate between Hobbes and Rousseau. Zhuangzi's skeptical and relativist arguments are as lively and challenging as Descartes' first two Meditations, Sextus Empiricus, or Peter Unger, and his positive vision is interestingly distinct from that of any major philosopher in the West. If we assess importance by historical influence, different potential criteria come into competition. Considered globally, Confucius, Laozi, and to a lesser extent the other major classical Chinese philosophers have been enormously influential, probably more influential in Eastern Asia than Socrates, Plato, and Aristotle have been in Europe and the Americas. Even in the United States among the general population Confucius and Laozi are better known and more broadly discussed than any but a handful of European philosophers. Still, perhaps the proper measure of historical importance for us philosophy professors in the U.S. in deciding what to teach and read is the influence that a particular philosopher has had on contemporary philosophy in the United States. Here, finally, we might have a justification for our ignorance of classical Chinese philosophy. But it is then worth inquiring why classical Chinese philosophers are not especially influential in contemporary U.S. philosophy. One possibility is historical accident: Because the dominant culture in the United States traces back to Europe, the classical Chinese philosophers were not taught to, and thus not read by, the succeeding generations. Ignorance thus apparently justifies ignorance: Because we don't know their work, they have little impact on our philosophy; because they have little impact on our philosophy, we are justified in remaining ignorant about their work. Note 1: When I wrote this in 2001, empirical moral psychology was still dominated by intellectualistic models that left little room for emotion and spontaneous reaction, and seemed really to be measures of how good a moral philosopher one was (esp. Lawrence Kohlberg's stage theory). Philosophical moral psychology was not, in my view, a whole lot better. The intervening years have seen a huge surge of interest in morality as a phenomenon in which emotional and intellectual processes, spontaneous reactions, habit, and more thoughtful reflection, all come together in complicated ways. We are finally starting to catch up with Mengzi and Xunzi! (In this one respect at least.) If you had been reading ancient Chinese philosophy in the 1990s, you might have been surprised that the field hadn't moved past Kohlberg even sooner. My own reaction was to criticize intellectualist models of moral psychology by close empirical examination of the moral behavior of ethics professors -- a project that grew directly out of my work on Mengzi and Xunzi. One huge advantage of reading outside of the dominant tradition, in my view, is that it helps you see past the narrow trends and presuppositions of your current cultural situation -- and the farther out of the mainstream you go, the more so. Note 2: In this piece I didn't comment on the possibility of implicit bias (or even explicit bias) against Asians in U.S. philosophy departments, but I have become increasingly convinced that it plays an important role. Last week, I created a list of the 267 most-cited philosophers in the Stanford Encyclopedia of Philosophy. I analyzed this group by gender and ethnicity, finding only 10% women and 3% ethnic minority. I've done some further analyses, but several people have urged me also to look at some other groups that might suffer prejudice, to see how they show on the list. Before getting into that, let me emphasize: I regard this list as a rough metric of a sociological phenomenon, mainstream visibility in recent Anglophone/analytic philosophy. I do not regard it as a metric of objective quality or importance from a global perspective. Judith Butler, David Hull, and Kwame Anthony Appiah are pretty visible members of this group. Among philosophers deceased 20 years or more ago, H.L.A. Hart and Richard Montague are also widely viewed as LGBT. I am hesitant to name living or recently deceased philosophers, even if they are "out", unless they seem willing to put themselves forward publicly as examples, but based on conversations I've had with others in the discipline, I estimate a minimum of 2-4 additional LGBT philosophers among the 267. It's perhaps also worth noting that two of the most famous gay men of the 20th century almost make the list, Michel Foucault (20 entries) and Alan Turing (19). I welcome further information, but only if consistent with respecting people's privacy. It's an interesting question to what extent current Anglophone philosophy exhibits prejudice against this group (and whether perhaps there is more prejudice against transgender people than against other LGBT people). I know no philosophers on this list who have a very visibly obvious physical disability (excepting those who acquired disability later in life, often due to ageing, after their reputation was established), unless we include Paul Feyerabend, who walked heavily on a cane due to a war injury. Please correct me if I am mistaken! Less obvious disabilities are of course more difficult to identify, and it's not clear exactly how to categorize disability. I am aware of a couple philosophers on this list who have disvalued speech patterns such as stuttering. I hesitate to spotlight individual living or recently deceased people in this category unless they put themselves forward, but the ancient Chinese philosopher Han Feizi is interesting in this connection: He is said to have stuttered so much that he turned to writing so that his opinions would be taken seriously. Certainly, too, there are at least a few philosophers on this list with histories of depression, severe anxiety, and/or alcoholism, as well as serious chronic physical diseases, though my information here is too sketchy to warrant quantitative analysis. Shelley Tremain has recently presented data suggesting that in North America the percentage of employable disabled people in philosophy departments is very much less than the percentage in the general population. I have already commented on how Anglophone this list is. Foucault, for example, at 20 entries by my method, doesn't even rank. (He does have his own dedicated entry, though.) Anglophone/analytic philosophers just don't cite recent European philosophers very much. (Here's one analysis I did in 2012 that shows the amazing magnitude of this tendency in the top-ranked journals.) Can we quantify this a bit more? I've done some quick biographical searches of the top 50 philosophers on this list (actually 53, given ties). If my biographical information is correct, only nine (17%) were born in non-Anglophone countries. But actually that substantially underestimates Anglophone dominance. Derek Parfit was born in China, but to English parents who returned to England when he was still an infant. Thomas Nagel was born in Yugoslavia but was educated at Cornell, Oxford, and Harvard. Bas van Fraassen was born in Netherlands but emigrated with his family to Canada when he was 14 or 15. Timothy Williamson was born in Sweden but went to grammar school in England, and then Oxford. Nicholas Rescher was born in Germany but came to the U.S. at age ten. Joseph Raz was born in Mandate Palestine and got a Magister Juris at Hebrew University, but then went to Oxford for his doctorate and publishes entirely or almost entirely in English. That leaves Alfred Tarski (Polish), Karl Popper (Austrian), and Jaakko Hintikka (Finnish) as the least Anglophone members of the group, though both Popper and Hintikka still published mostly in English. Worth noting, too: All three are in the oldest generation I analyzed (born 1900-1930). Among the top ten philosophers on the list, eight were born in the U.S., one in Britain (Bernard Williams), and Nagel went from Yugoslavia to the U.S.
Again, please correct me if I have committed any errors. I doubt that the proper moral to draw is that Heidegger was right that philosophy is best done in certain languages but wrong about which particular language is the best. Eric Schliesser comments that this list "is a testament to the successful emancipation of Jewish men in the Anglophone world". And maybe that's right. Fully half of the top ten philosophers on this list are Jewish or have Jewish backgrounds: Putnam, Kripke, Nozick, Nagel, and Nussbaum. (I'm relying on internet sources of iffy reliability for Nagel and Nussbaum, so I welcome confirmation or correction.) A quick-and-dirty count using personal knowledge and Wikipedia's list of Jewish philosophers (except in one case where I doubt Wikipedia's accuracy), I count 35/267 (13%), which is probably an underestimate. But even going with that low-ball estimate, the proportion of Jews on this list substantially exceeds the proportion of Jews in the population as a whole (2% of the U.S. population, for example). But before we hasten too quickly to the conclusion that there is no prejudice against Jewish philosophers, it's worth noting that early 20th century Germany, despite outrageous levels of antisemitism, also had an impressive number of very influential Jewish philosophers, including Edmund Husserl, Ernst Cassirer, Hermann Cohen, Max Scheler, Walter Benjamin and Martin Buber. Last week I posted a list of the 267 most-cited contemporary philosophers in the Stanford Encyclopedia of Philosophy, including a gender and ethnicity analysis. I've been fiddling around with the data a bit more (as well as correcting a few errors). * In 2010, I posted a similar list. The biggest methodological difference is that I included historical entries in 2014, while I had excluded them in 2010. Thus, Jonathan Barnes (71st), Julia Annas (81st), Anthony Kenny (95th), and many other historians appear on the 2014 list but not in the 2010; and Martha Nussbaum, Jonathan Bennett, Christine Korsgaard, for example, appear higher up the 2014 list (9th, 30th, and 58th, respectively) than the 2010 list (19th, 52nd, and 99th). * Another striking difference is several logicians' much higher ranking in 2014. For example, Jaakko Hintikka rose from 76th to 30th, Alfred Tarksi from 72nd to 46th, Kit Fine from 82nd to 48th, and Nicholas Rescher from 72nd to 48th. My first thought was that this might reflect a large number of new SEP entries in logic and philosophy of math. And maybe that is part of the story, but a quick perusal of the SEP entries published between 2010 and 2014 does not show a particularly striking trend in that direction. * I was also struck by Stephen Darwall's shift from 156th (21 qualifying entries in 2010) to 66th (48 qualifying entries in 2014), despite the fact that there was no general rise in ethicists' rankings. 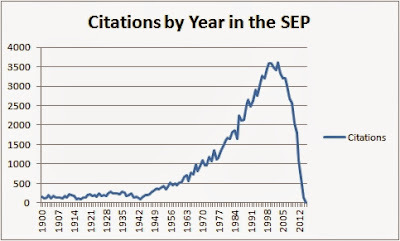 The peak citation year was 2000 in my 2010 analysis. Also, if you squint at the graph above, you'll notice what seems to be dips in the production of cited work during the two world wars. The Baby Boom Philosophy Bust? In 2011, I conjectured that the generation of philosophers hired during the 1960s to teach the baby boomers -- the depression-war generation -- sat atop the social hierarchy in philosophy through the 1990s and prevented the baby boomers from attaining as much visibility as they otherwise would have. If so, this would explain the relative paucity of boomers in the topmost slots: Nussbaum is the only boomer in the top twenty, whereas depression-war babies occupy ten of the top twenty slots (Lewis, Kripke, Nozick, Nagel, Searle, Fodor, Dennett, Harman, Jackson, and van Fraassen). Now another possibility is that the baby boomers have not yet had time for their influence to be fully felt and reflected in the SEP. Indeed, this is quite possibly the case. Even the older boomers are still in their 60s and philosophers often produce very influential work late in their careers. On the other hand, the SEP's bias toward recent work, as reflected in the chart above, would seem if anything to favor the boomers over the older generations. Also, in an earlier analysis of Philosopher's Index, I found that philosophers tend to receive peak professional attention (in the form of mentions in the abstracts of philosophy articles) around ages 55-70, which is the current age range of the baby boomers. Then again (back on the first hand), if we look at the entire 267 and not just the top 20 -- still a very select group! -- the boomers are about as well represented as the previous generation. My technique (as mentioned in the post) was to only count first authors. Second authors proved computationally intractable. I did keep noticing names of some people who were often appearing as second authors and who thus deserve to show higher on the list. Let me apologize for the unfairness of this. I'm tempted to list some names, but since I can't do so systematically I fear compounding the unfairness toward the regularly appearing second authors who didn't happen to come to my attention. If someone wants to attempt a systematic repair, I would welcome that. Eric Schliesser suggests an interesting measure of closeness to the sociological core of Anglophone/analytic philosophy by considering what percentage of the list you can count as former teachers of yours. (I, like Schliesser, count 4 [1.5%].) Another measure might be how many of the authors on the list you recognize well enough to be able to say in what subfield they made their main contribution. (For me, this would have been maybe all but ten.) Eric also makes an interesting point about Jewish philosophers, which I'll discuss in a follow-up post. Brian Leiter re-analyzes the data to rank departments by summing the entry count of the faculty appearing on the list. Interestingly, there is considerable overlap between the rankings derived by this SEP-based method and Leiter's 2011 Gourmet Report rankings of philosophy departments in the English-speaking world. All but three departments in this "SEP top twenty" appear in the top twenty of the Gourmet Report's rankings, and those three (UT Austin, Notre Dame, and Duke) all appear in the Gourmet top 30. Conversely, all but three of the Gourmet top 20 departments appear in this SEP-based top twenty, with the exceptions (Cornell, Arizona, and Toronto) all in the last spot among the Gourmet's top 20 (a 5-way tie for 15th). I find it very striking that these two superficially very different methods yield such similar results. It suggests, to me, that whatever sociological phenomenon the Leiter rankings capture is also captured pretty well by looking at SEP citation rates. There is much less overlap, in contrast, between the top scoring schools in the 2010 NRC research rankings and either the Leiter or SEP rankings (e.g., CUNY, Yale, USC, and UCLA, in this SEP-based top-twenty, are all 50th or lower in the NRC if one sorts by the average of the high and low research scores). A number of people have urged that I look at potentially disadvantaged groups besides women and ethnic minorities, especially queer, disabled, Jewish, and non-native English speaker. So I'm working a follow-up post about that, hopefully up later today. Update: I've posted the analyses. As I mentioned Monday, my son sent me a list of bibliographical entries in the Stanford Encyclopedia of Philosophy, so I thought I'd update some of the citation analyses I did in 2010-2011. Below is an ordered list of the most-cited contemporary authors. * "Contemporary" means born 1900 or later. * Each author is counted only once per entry, and then only if that author receives a bibliographical line as the first-listed author on the entry's main page. Evaluating second authorship proved intractable. Sorry! I recognize that this results in substantial underestimation of second-listed authors, which is especially regrettable when authorship order is determined alphabetically rather than by magnitude of contribution. * Unlike my 2010 list, this list includes the historical entries. * The SEP has a strongly "analytic"/Anglophone perspective. So Foucault, for example, at 20 entries, didn't quite make the cutoff. * If you just plug the author's name as search term into SEP's front page, you'll get substantially more page hits than my method delivers (e.g., people in editing roles, or as second authors, on in subentries, or as false positives). So please don't critique my numbers via that method! I do welcome more thoughtful corrections. * After computerized sort, I hand-coded the data, in some cases correcting misspellings and merging authors (e.g., Ruth Barcan = Ruth Marcus), more often separating authors with similar names (e.g., various A. Goldman's). I estimate coding error of up to about +/- 2 entries. * Unsurprisingly, given the state of the discipline, it's overwhelmingly white men. For more details, see my gender and ethnicity analysis. Interesting piece on academic urban legends here, featuring a convoluted and deliciously ironic analysis of the rumor that spinach is a good source of iron. HT Charlie Tyson in Inside Higher Ed, who offers further reflections on the issue, including the on ethics of citation. My fourteen-year-old son Davy is teaching himself to program, so for fun last week I had him pull all the reference sections out of the 1422 front-page entries in the Stanford Encyclopedia of Philosophy. In 2010-2011, I'd written a few posts analyzing SEP bibliographies. But my selection at the time had excluded entries on particular individuals and historical eras, and the SEP has grown and updated quite a bit, so I thought it might be interesting to revisit some of those analyses. For quick and dirty fun, we can toss these names in the SEP search engine and see how many different entries get hits, ranking the philosophers accordingly. Interestingly similar -- and thus partly validating each other, in a way. For example, the top five are the same, only with Aristotle and Plato swapping the two top spots. Leibniz shows the biggest difference in rank -- 7 in the SEP vs. 12 in the Leiter poll. Hegel is next, 15 in the SEP vs. 11 in the Leiter. All the others are within 3 places, most within 0-2. Mill is a bit higher in the SEP perhaps partly due to attracting more false positives than the others. Overall, the rank correlation is a solid .92. Might there be others in the SEP top twenty that weren't in Leiter's top-twenty poll results? Well, actually things get messy outside the top 20. Berkeley is Leiter's 21, but he's hard to pull out of the SEP because of false positives from the university of the same name. Epicurus, 22nd in Leiter's poll, would slightly edge Kierkegaard, but not in a worrisome way (66 entries vs. 63). Russell is ranked 23rd in Leiter's poll -- also a lot of false positives there, plus possibly a recency bias. (See these old data on recency bias in the SEP, which I plan to update soon.) Then Rawls, Bacon, Smith (Adam), Quine, Kripke -- all also either too recent or drawing too many false positives. Thus, keeping comparisons within Leiter's top 20 seems the best plan. Now, Confucius is one of the most important figures in the history of Asia, both specifically in Asian philosophy but also more broadly in East Asian culture. Perhaps no philosopher in the history of the world has had more influence than he. So I find the poll result odd! But Confucius fares even less well in an SEP hit count than in the Leiter poll: Heidegger and Anselm both appear in many more entries than does Confucius. This is my way of saying, I suppose, that these types of analyses capture a certain sociological phenomenon among the Leiter Reports readership and the SEP authors and editors. But I happen to find the sociology of philosophy very interesting!